UMD With Penalty Problems… What's New? It was a point of emphasis in Coach Sandelin's weekly presser that the team is taking too many penalties. And although that may be a symptom of the early season tight officiating, second highest average in the nation at 23 minutes per game is ridiculous. It has been recurring theme over the past few seasons that UMD is in the top ten in the nation for penalties, but how does it stop? How is hockey discipline taught when the seeming culture of the upperclassmen is not conducive to more five on five time and less special teams? Final note on the penalties, if the team puts together wins, the issue will become less glaring. Lose half or more of the games and it will be in the forefront. No Sophomore Slumps. Dom Toninato is not seeing a sophomore slump. In fact he is leading the team in goals and points with five and seven respectively. He is back looking stronger and hungrier than ever and his work off the ice is obvious. Toninato's five goals puts him on pace to crush his seven goals in his freshman year. With two short handed goals in four games, he has equalled his total form all of last year. The shorties paired with a power play goal demonstrates that he is a main player who is being utilized on the special teams. Close behind Toninato is Alex Iafallo with one goal and five assists and Carson Soucy with two goals and three assists. Those three sophomores along with Tony Cameranesi round out the top four scorers for the Bulldogs. Picks by @afiskness. Last weekend the Bulldogs struggle to play a good game of hockey for a full game continued. The play in the first half of the Friday game was not where it should be if the team is going to be a contender. Saturday’s game however was much better. Hopefully the goaltending will improve and become more consistent. It is early in the season but this team looks like they could be good if they get solid play between the pipes. Denver @ Minnesota Duluth - The Pioneers come into the series ranked 11th playing at Amsoil Arena against the #19 Bulldogs. Last year the Bulldogs struggled at home this season they are hoping to find some success. This will likely be two high scoring games which will end in a split. St. Cloud State @ Union - The #9 Huskies travel to Schenectady to play last years NCAA champions the #2 ranked Dutchman. This will be a good test for both teams. I give the edge to the Dutchman who seem to be continuing where they left off last season. I will pick a Split as Huskies find a way to win one of the games. Colorado College @ Boston College, CC @ New Hampshire - The unranked Tigers travel out east to play the #6 Eagles in Chestnut Hill followed by game at the Whittemore Center in Durham against the receiving votes Wildcats. The road and playing better teams will take its toll on the tigers who will lose both games. Saint Lawrence @ Miami - The Saints are unranked looking to find some consistency. Last weekend they split a series with Ferris State. The #10 Redhawks are now red hot as they are on a 3 game winning streak. I think Miami is finding its grove and will sweep. Providence @ North Dakota - The #5 Friars travel to Grand Forks to take on the #3 North Dakota men's hockey team in a great non-conference series. North Dakota looked like the team should last week against the Tigers after spliting the weekend earlier against the Beavers. The Friars have only played two NCAA games this season splitting at Ohio State. This series should be a split. Alaska @ Western Michigan - These two unranked former CCHA Conference rivals renew the series this weekend in Kalamazoo. The Nanooks are red-hot having not lost a game yet this season mean while the Broncos are hoping to get the bus back on the pavement after being swept last weekend. The home ice should be enough for the Broncos to get a split. The season is early and the Bulldogs are still trying to answer questions. Good to look for answers now than after the NCHC schedule starts. How are the goalies going to spilt time and who is first? McNeely has lots to prove still even after a stellar game last Sunday during his 3-0 shutout. Kaskisuo did have a shaky start, but did settle in, along with the rest of the Bulldogs, to give the Gophers a good challenge the second half of the game last Friday in UMD's 4-3 loss. Will UMD protect home ice this year? A 5-10-3 record at home last season was terrible. A contender for anything other than basement of the conference has to do better than that. On the flip side, an 11-6-1 record away from AMSOIL kept UMD in the top half of the NCHC which gave them home ice. Bad news was home ice equalled being swept out of the playoffs at home. The home-and-home series should be interesting also. It is the first of two this season with UMTC being the second. Let the debate start, home first or second night. They get both situations, but for now it will be home first. StatPack will start next week when conference play starts up and we have some decent data to share. Picks by @afiskness. 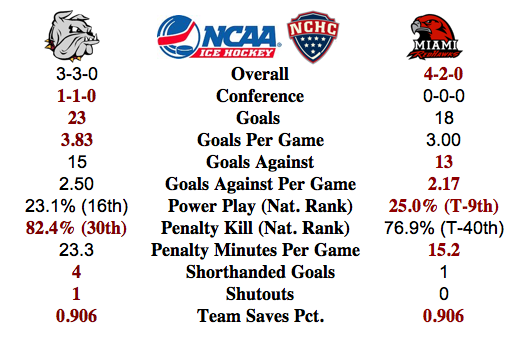 The results of last weeks games brought a few surprises to NCHC teams. First who would have thought that the Beavers would not only beat North Dakota but make it a rout. Second, high ranked teams did not fare well in all of college hockey. The opening period of the Bulldogs and Gophers game was troubling, but I was happy to see the team begin to settle in a little and play good by the end of the game. Nebraska Omaha @ Western Michigan: Both teams are unranked in this matchup at the Lawson Ice Arena and both are coming off splits. 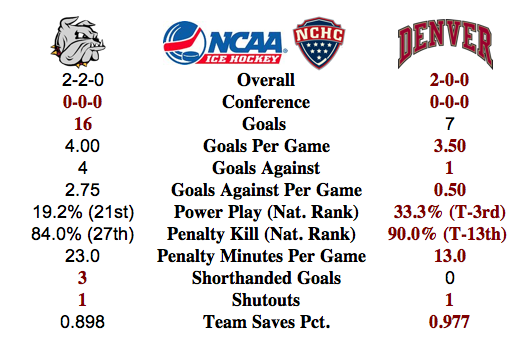 This will be the first NCHC league games for both teams. I don't see why I would chose anything other than a split at this point in the season, so it will be a split. North Dakota @ Colorado College: The unranked Tigers host the #3 North Dakota Men's Hockey team for the teams first NCHC games this season. The Tigers played well enough to hold onto wins after blowing a 2 goal and a 3 goal lead against the Chargers. North Dakota should be a better team then Alabama Huntsville, but they didn't look that way on Friday night. I will go with a North Dakota win and tie. Minnesota State Mankato vs. Minnesota Duluth: Last week both teams split their games playing on the road, although the Bulldogs faced better competition. The Mavericks are ranks #12th and Bulldogs are now ranked #20 in this home and home series. These games will likely come down to goaltending for both teams. I expect to see the Bulldogs continue with a goalie rotation and I am guessing McNeely gets the Friday nod. I am going to pick a split. Miami vs. Ohio State: This series will be a home and home between the #11 Redhawks and the #17 Buckeyes. The previous weekend both teams split their games. The Buckeye split with the highly ranked Friars while the Redhawks split with the unranked Falcons. This series will be another split. Rensselaer Polytechnic Institute @ Denver: The #16 Pioneers host the unranked Engineers. This should be a great couple of games. The Pioneers have had difficulty the last couple seasons with ECAC teams and the Engineers look to be a contender this season. I will pick a split. On the night of the Bulldog's first game, an exhibition against Lakehead University of Canada, leads right into the season just four days later. A strong showing would be preferred, but a lackluster last minute (1:35 to be exact) escape is the game we got. From the get go of the new season all eyes were on the net minder. Would McNeely finally take the reigns and be the main guy as we thought when he arrived? Or would freshman Kasimir Kaskisuo emerge as the dominant force. The first indication of the current situation did not take long as Lakehead buried their first shot of the night beating McNeely 0:42 into the contest. Not the start anyone hoped for. Maybe just as concerning was the lack of scoring throughout the game. UMD did not find the back of the Thunderwolves net until 6:03 into the second period as Brett Boehm scored with helpers from Austin Farley and Carson Soucy. The tie would be short lived as UMD would go into the second intermission again trailing, now 2-1, after McNeely yielded a goal midway through the second. UMD did held a decisive shots on goal edge throughout the game ending with a 61-21 edge. But it wasn't until very late in the third period that the Bulldogs took their first lead before the 4-2 final. third period goals for UMD were tallied by Farley, Justin Crandall, and Alex Iafallo. On the horizon is the Ice Breaker Tournament held in South Bend and hosted by Notre Dame where UMD will face a tough test against the Gophers Friday afternoon. A definite challenge for a team that has many challenges. UMTC is coming off of their exhibition opener, a 5-0 win over visiting Northern Alberta. The game Friday starts at 1:05pm CDT and can streamed for free along with all other tournament games. Rough start in Omaha for the Mavs. Not only do they lose their exhibition game against the same Northern Alberta who lost to the Gophers 5-0, but the Mavs were shutout 4-0. The only other loss in NCHC exhibition play was Miami being shutout 3-0 by the visiting US U18 Developmental squad.